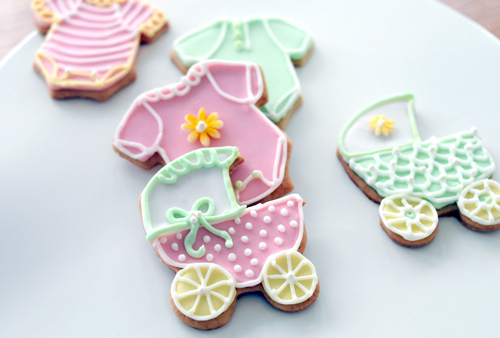 I've been waiting for a while to use this set of adorable baby shower cookie cutters and Haley's shower was the perfect opportunity! 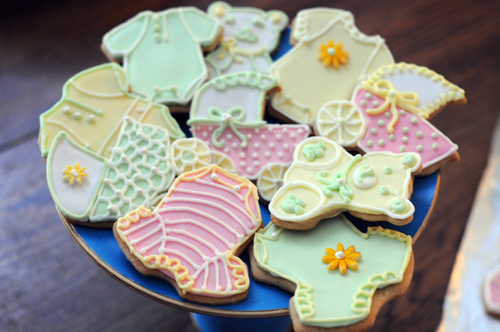 I wanted to enhance the traditional cut-out cookie recipe that I use every year around the Holidays, but I also wanted to please the palates of all the guests expecting a sweet and traditional cookie. 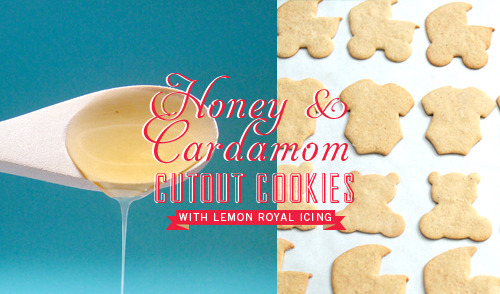 Most guests could't point out the use of cardamom and honey, but they knew there was something extra special about these cookies. Here's the recipe along with some shots from the shower! 1. In a bowl, combine the flour, cardamom, salt and baking soda. Set aside. In the bowl of an electric stand mixer fitted with the paddle attachment, beat the butter and sugar on medium speed until light and fluffy. Add the honey, egg and vanilla. Continue mixing on medium speed until well blended, about 1 minute. Add the flour mixture and mix on low speed until the dough comes together. Scoop out the dough ball onto a sheet of plastic wrap and smooth into a flattened disk. Wrap tightly in the plastic and refrigerate until chilled, at least 1.5 hours. Dough can be refrigerated for up to 3 days or frozen for 1 month. 2. Preheat the oven to 350 degrees F. Line 2 or more baking sheets with parchment paper or non-stick baking liners. Working with your chilled disk, roll out the dough on a floured work surface to about 3/16 inch thick. 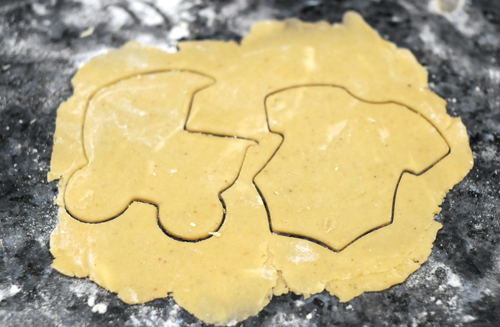 Use cookie cutter to cut out shape and place 1 inch apart on the lined cookie sheets. 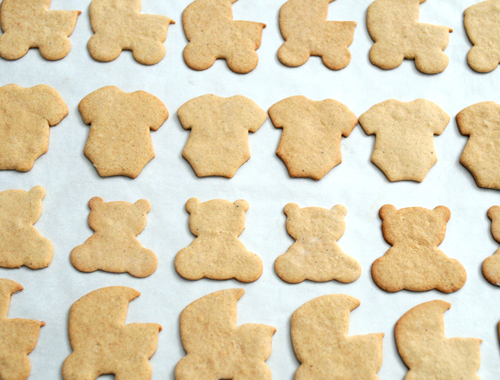 Gather and re-roll scraps to make more cookies. Bake one sheet at a time for even cooking for 8-10 minutes or until the edges turn golden brown. Let the cookies cool on the sheets for 5 minutes, then transfer them to a cooling rack. 1. In the bowl of your electric mixer fitted with the whisk attachment (or with a hand mixer), beat the confectioners' sugar, meringue powder and lemon juice until combined. Beat on medium to high speed, adding water as needed, until until very glossy and stiff peaks form (5 to 7 minutes). This is the proper consistency to pipe a border around your cookie. 2. 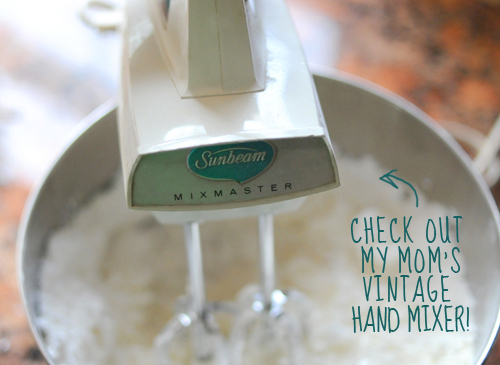 Separate the icing in your mixer into 4 equal batches, leaving one batch in the mixer and placing the other batches in smaller bowls (one for each color). 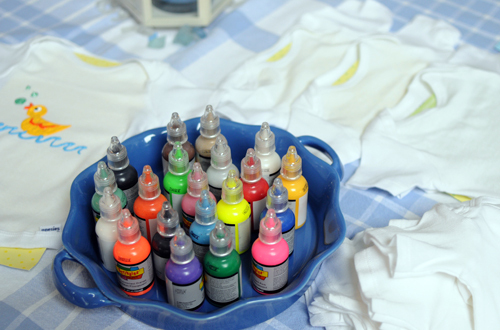 Add a small drop of food coloring into the bowl and beat the icing until the color is fully incorporated. Use a rubber spatula to scrape all of the icing into a small bowl, and cover. Repeat with the 3 other colors, cleaning your mixing bowl between batches. After mixing, you should have 4 bowls with colored icing. Place half of each batch into a prepared piping bag with coupler and no.3 tip on it. Note: If you don't have a piping bag and piping tips, you can use a sturdy sealable sandwich bag and snip the very tip of the corner with scissors. 3. 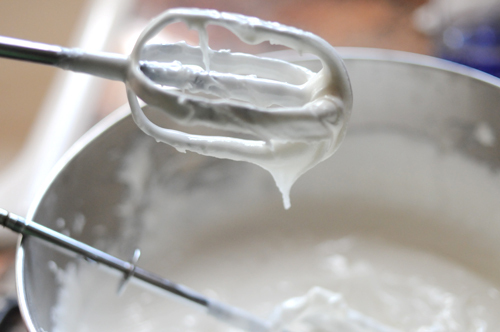 Using a whisk, thin down the remaining batches of icing with water. The proper consistency is when you lift the whisk, the ribbon of icing that falls back into the bowl remains on the surface of the icing for a few seconds before disappearing. 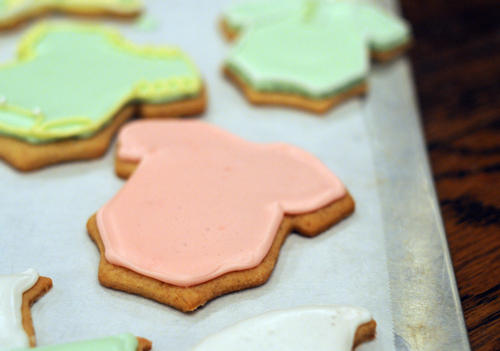 Cover the icing immediately as exposure to air will harden it. 4. 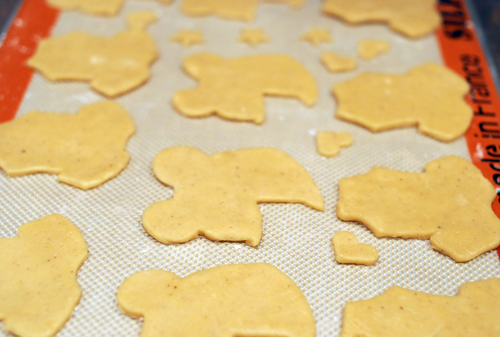 Assemble the cooled cookies on a cookie sheet covered in parchment paper (for easy clean-up). 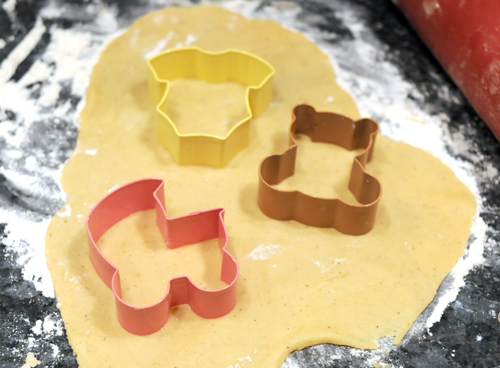 Pipe borders around the perimeter of each cookie with the colored icing. 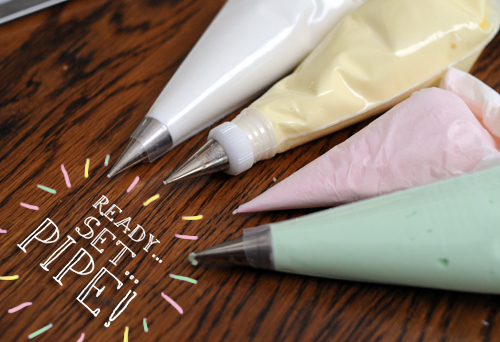 Set piping bags aside and let dry completely. 5. 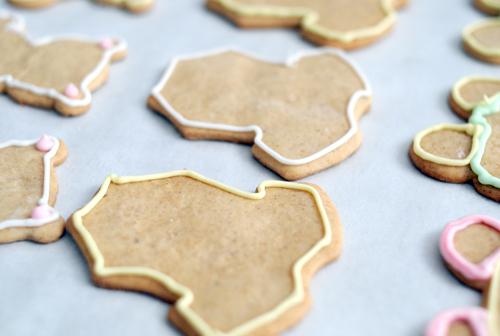 Using a small spoon, cover or 'flood' the entire surface of the cookie with the thinned icing. Use a toothpick to push icing into hard to reach areas. 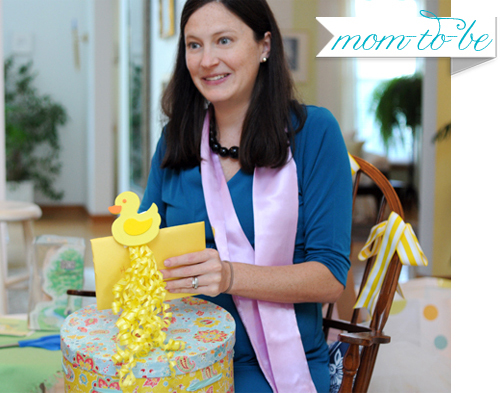 Let dry completely before decorating with remaining icing in piping bags. 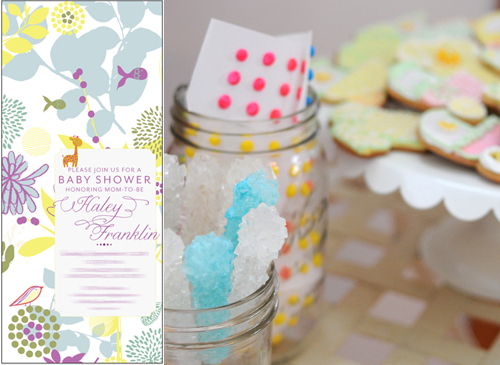 (Left) A snapshot of the invite. (Right) I dressed up the dessert table with some nostalgic candies. 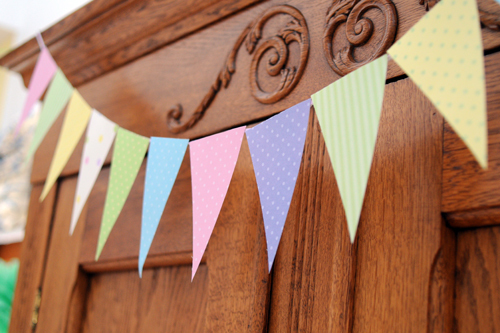 These colored paper flags were easy to make and a festive addition for the baby shower. 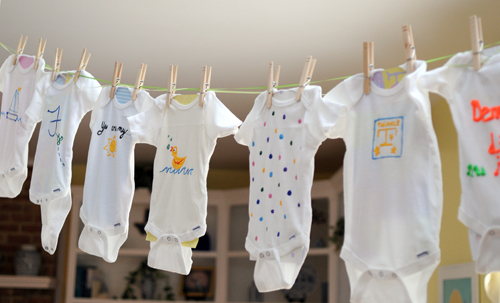 We all decorated onezies for the mom-to-be. 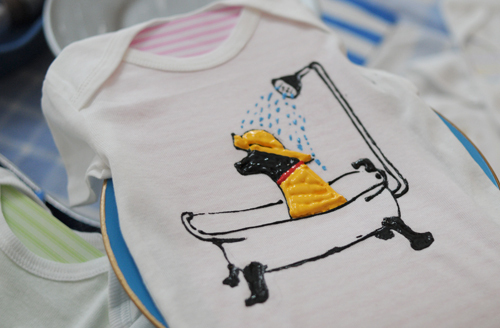 I picked this idea up at a friends baby shower a few years ago. 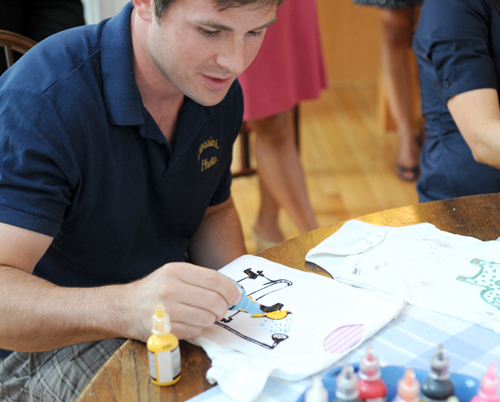 It's easy to do and lets everyone at the shower design a personal message for the baby. 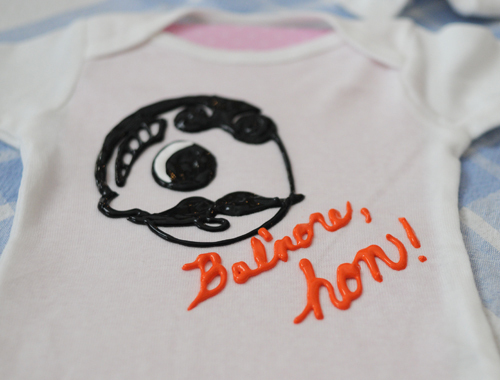 My sister lives in Baltimore, so I had to include a National Bohemian Beer onesie. Natty Boh! 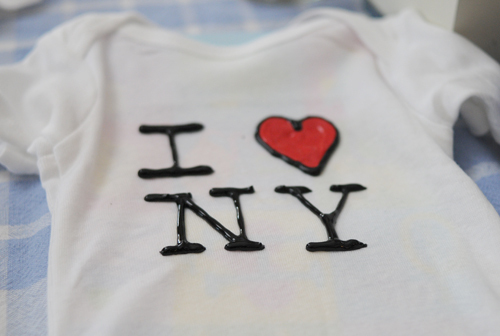 And I had to represent for NYC! Nice sharing! Can I share your post on my blog?